HUNTINGTON, W.Va. — Capt. 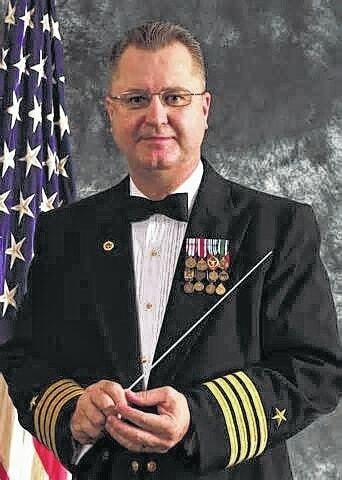 Brian O. Walden will join the Marshall University music faculty in August as the new director of bands, following his July retirement as commanding officer of the United States Navy Band. Walden earned a bachelor’s degree in music with a double major in religious studies from Saint Leo University in Florida and a master’s degree in wind ensemble conducting from the New England Conservatory of Music in Boston, where he was given the Outstanding Alumni Award in 2012. He also holds a graduate diploma in national security strategic studies from the U.S. Naval War College in Newport, Rhode Island. He is currently studying in the doctoral program in music education at George Mason University. A native of Trenton, S.C., Walden has guest-conducted ensembles and has performed as a trumpet instrumentalist in more than 74 countries. He has performed with the Virginia Wind Symphony, the Virginia Beach Symphony Orchestra and La Orquesta Salsa y Mas, a Latin salsa ensemble. Walden has served as director of music at Saint Paul’s United Methodist Church in Cambridge, Md., and at St. Andrews United Methodist Church in Virginia Beach, Va., and also served as the orchestral brass instructor for the Virginia Beach Public Schools Academy of Visual and Performing Arts. His current research project is on the music and literature of composer George Thaddeus Jones. His awards include the Defense Meritorious Service Medal, Meritorious Service Medal, Joint Service Commendation Medal, Joint Service Meritorious Unit Award, Navy and Marine Corps Commendation Medal (two awards), Navy and Marine Corps Achievement Medal (seven awards) and others. To learn more about Marshall University’s music program, visit www.marshall.edu/music.